Very severe cyclonic storm Titli has continued to move North North-westwards, intensified further and is taking aim at North Andhra Pradesh and South Odisha coasts. It is expected to cross between Gopalpur and Kalingapatnam today morning. Very heavy wind gusts of speeds exceeding 160kmph is expected in these areas with a storm surge of 1m in coastal areas. People are advised not to venture outside, find safe ground and follow the advisories of local disaster management authorities. The system is expected to weaken into a Depression following land interaction and recurve North North-eastwards towards Gangetic West Bengal by tomorrow. Heavy to very heavy rains are forecast for Northern AP, coastal areas of Odisha and West Bengal. In Tamil Nadu, clear hazy and dry conditions will prevail over most parts of the state. Above conditions are induced by cyclone Titli moving away and sucking moisture from peninsular India. Parts of Kerala will remain wet. Another very severe cyclone Luban off west Arabian sea is of no significance for Indian mainland as it tracks westwards into Yemen and South Oman coasts. 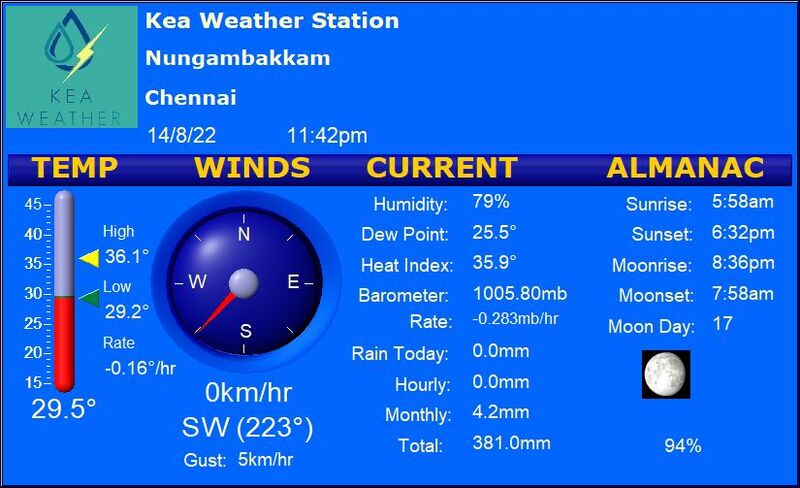 Chennai – Dry and warm with day high of 35C. Evenings tend to be less humid with min of 25C. Vellore – Dry and warm with highs of 35C and lows of 23C. Trichy – Dry, hazy and warm as max settles at 36C and min at 25C. Madurai – Partly cloudy, less humid with less chance of rains. Day highs of 35C and lows of 24C is expected. Coimbatore – Warm and partly cloudy with highs of 34C and lows of 23C. No chance of rains.